Cynden Frasier (Cyn) is a member of a group of immortal warriors, the Protectors, assigned to protect humans in Atlanta, Georgia, the epicenter of a major uprising in demon activity. 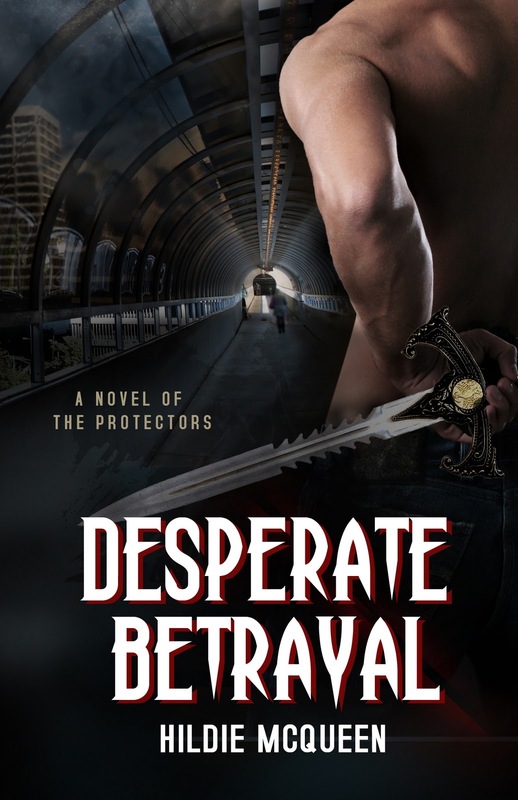 When Cyn is approached by a beautiful woman in a dirty alley, he is intrigued by the fact that she can see him for what he is, a terrifying demon slayer, and still dares to approach him. Emma Blake, a half-demon, has to convince Cyn to help rescue her sister from powerful demons. Terrified that the Protector will kill her if he realizes what she is, she still goes against every instinct and approaches Cyn for help. Despite knowing that she is leading them both into territory so wrought with treachery, neither of them may survive. Can Cyn and Emma overcome betrayal, the ancient rules that prevent Protectors from taking a wife, unless she is his one true mate? And if they do, will it even matter? Emma Blake always felt at home in the shadows. It was where she lived, always concealing the truth from those around her. Now as she hid in the doorway of an abandoned building, she couldn’t help but compare the current situation to her life. The dampness of the brick wall behind her seeped through to her skin, as she pushed further into the dark to avoid being noticed. The putrid smell of trash and urine barely registered, as she was mesmerized by the scene unfolding before her. The scene invoked images of the endless battle forces of dark and light had been waging since the dawn of time. Although beautiful to behold, the warrior who fought before her wasn’t exactly an angel, but he was as close to one as she would ever get. In desperate need of his help, she took a big chance sticking around; because once he caught her there were only two possibilities for her. He’d either help her or he would kill her. The air blew chilly on this damp, drizzly day in Atlanta, a city that for some unknown reason, in the last few years, had become a hotbed for demons. With such an influx of demons, human assaults were on the rise. Emma continued to watch from the shelter of the doorway, as the Protector fought his aggressors. Ten huge low-level demons armed with medieval-type swords. She tensed, but didn’t flinch as a demon’s severed arm flew past her and hit the ground next to her foot with a sickening thud. Emma had no doubt as to whom the victor would be in the end. The fluidity of the Protector’s movements and the speed of the fight enthralled her. Her gaze locked on his biceps. Muscles bulged on his right arm, as he swung his sword in a way that seemed almost effortless. Impressive, for the weapon he wielded had to weigh at least twenty pounds. He dodged a blow and struck out with his sword to slash through one demon’s chest. A dagger flew from his left hand and found its target in another’s heart. Hildie McQueen is a whirlwind who refuses to wear anything but jeans and heels. She grew up on the San Diego/Mexico border, joined the military at seventeen and never returned. After living in Germany, Texas and Hawaii, she finally settled in the beautiful southern town of Augusta, Georgia. Biracial, half Mexican and half African-American, Hildie’s native language is Spanish, but English is her favorite way of communicating now. Her mission in life is to make as many people as possible to feel normal. It’s an easy thing to do, for others to feel normal around her, because she’s anything but. Hello Sarah! Thank you so much for the pimp out! HI HILDIE! YOU ARE NEW TO ME BUT YOUR BOOK SOUNDS AWESOME! !